Simply stated, right now there is only one major certified organic cannabis company. 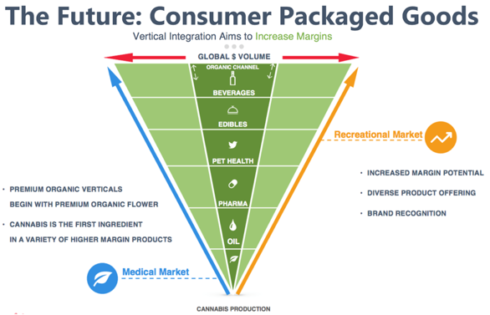 With roughly 60% of consumers preferring premium organic selections, the companies that can provide organically certified cannabis to the market will not only receive a demand advantage, but also a unit price advantage of over 34% per gram. Our research and due diligence indicates the following company: The Green Organic Dutchman Holdings Ltd. (TSX: TGOD and US: TGODF), as the only major cannabis producer that has received organic certification from ECOCERT Canada. With a heavy focus on R&D, and expansion into new products, including organic cannabis-infused beverages, TGOD stands out as a unique investment opportunity in an ever-growing field of cannabis players. As the countdown brings Canada closer to full adult-recreational legalization in the country, consumers are beginning more comfortable with the variety of options they can choose from. Those options include premium quality strains, pre-rolled joints, gel caps, beverages, and more. New products including cannabis beers, THC pain relief creams, and cannabis-derived sleeping aids, are already coming into the market. Within the cannabis plant, are dozens of medicinally effective cannabinoids including the most well-known two, THC and CBD. Consumer packaged goods represent a huge opportunity for cannabis producers—a point that no serious company has ignored. When Canopy Growth signed a development partnership deal with major beverage distributor Constellation Brands in late 2017, the game in the industry changed. Fast forward to summer 2018 when Constellation invested another $5 billion into Canopy, the game changed yet again. The industry was immediately validated, and mass speculation ensued for which bottlers would marry which growers. Rumors followed that Diageo, the largest beverage alcohol company in the world, currently valued at $347 billion was circling the industry in preparation for the advent of a new drinkable-cannabinoid market. Recent events included the partnership between HEXO Corporation and Molson Coors, to develop cannabis beverages. Knowing that it has an advantage with its organic cannabis plants, TGOD made a series of similar strategic moves, in order to diversify its offerings. TGOD established its strategic Beverage Division, to provide a pathway into the cannabis market for large-scale beverage companies by way of direct investment, joint venture, or other suitable opportunities. This was bolstered by an exclusive licensing agreement with Ripple SC, which boasts a proprietary, patent-pending suite of fast-acting, water-soluble ingredient products. Ripple’s method allows consumers to quickly and easily infuse cannabinoids into beverage and food products and TGOD owns the exclusive international rights. Other innovative technology deals include obtaining the international sales and distribution rights for Evolab and CBx Sciences. Evolab is the top selling vaporizer brand in Colorado. The company boasts a portfolio of products created from customized, organic pharmaceutical grade CO2 cannabis extraction. CBx Sciences has focused on alternative cannabinoids, such as CBN, CBD, and CBG. Their products include a natural health and beauty line focused on skin repair, body oils, salves and vapes. TGOD intends to develop out several new branded products, within its 40,000 sq ft innovation centre located within the company’s R&D campus on the Valleyfield, Quebec site. The company plans on advancing the cannabis sector as a whole, while also utilizing pilot manufacturing and scientific development facilities. To view more information on TGOD’s beverage division, click here to watch a recent interview by BNN Bloomberg and Brian Athaide, TGOD’s CEO. And while several of the majors have put the efforts in to establish themselves among the pack by boasting of premium quality and/or pesticide-free selections, gaining certified organic distinction has proved elusive to most operators—especially those larger than just a small craft operation. However, TGOD has done just that, and organic distinction increasingly matters in today’s marketplace. Among today’s marijuana consumers, the majority (52%) are millennials.3 From the COTA report, millennials are also top demographic purchasing organic goods (83%). The organic market is growing rapidly— and not only in Canada, but globally as well. Look no further than Amazon’s recent acquisition of WholeFoods. Canada’s trends mirror those seen throughout the developed world, including the US, extending into the cannabis market. Customers have become not only familiar with organic options that fit with their lifestyle choices, but also the premium price they’ve grown accustomed to paying to get their desired products. On a large scale, not every cannabis producer can grow their products under certified organic conditions. As well, since cannabis is still deemed illegal on a federal level, US growers will see gaining organic distinction to be nearly impossible for the foreseeable future. In Canada, the availability of organic options is only slightly better. To-date that only 2 of the total 114 granted licenses in the country have achieved certified organic distinction. Currently the only major publicly-traded company with that distinction is The Green Organic Dutchman (‘TGOD’). Due to their enhanced safety characteristics (synthetic pesticide/residue/chemical free) and enhanced cannabinoid profiles, organic products currently warrant an over 30% price premium to non-organic products. Which begs the question, if consumers are willing to pay more for organic cannabis, why are so few companies vying for these higher margins? Answer: Organic production can be more difficult to maintain and requires the right team and facilities to grow. The company not only lost its organic certification, but voluntarily recalled almost all of its products sold over the previous year. The two unapproved pesticides, myclobutanil and bifenazate, were not only found in the company’s products, but allegedly caused widespread negative symptoms leading to a class-action lawsuit in December 2017. While other licensed producers have experienced product recalls, TGOD firmly believes its products can set new standards for quality while remaining price competitive. To avoid similar issues arising, TGOD has adopted an approach that utilizes advanced automated hybrid facilities, proven Standard Operating Procedures (SOP’s), and hired one of the best organic cannabis growers in Canada, who worked for and developed the organic growing principles for Whistler Medical, the only other certified organic cannabis producer. 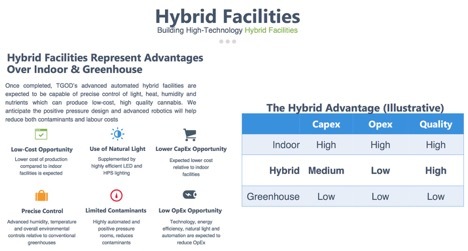 The hybrid model presents several advantages over conventional indoor and greenhouse operations—due to lower electricity rates, efficient use of water, a fully controlled and sealed environment dramatically reducing the risk for contaminants and a focus on sustainability and operational efficiency. Right between the initial capital expenditure of a fully automated indoor growing facility, and a lower-tech greenhouse facility, TGOD is set to utilize a medium capex hybrid facility. Once completed, the operating costs of a hybrid facility are lower than a high-tech indoor facility, while maintaining a comparable quality level. As the operation matures, TGOD expects its yields to increase, while the operation itself is de-risked. The facilities themselves have plenty of backing from some big players not only in the cannabis sector (Aurora Cannabis), but also from construction giants (Ledcor Group), and a major power company (Eaton Power). On TGOD’s flagship Valleyfield, Quebec facility, the same team that designed the state-of-the-art Aurora Sky facility in Edmonton have been reunited and deployed to create a hybrid haven for organic growth. But among the partners in the project, gaining the support of Eaton Power, a multi-billion-dollar power company, was perhaps the biggest victory. The industrial power wing of the massive multinational power management company Eaton Corporation plc (NYSE: ETN) saw the cannabis sector’s immense potential, and a future role in developing mega-greenhouses around the world. Eaton saw new cannabis operations being among the very new ventures available that could still move the company’s needle. Both the company’s Canadian operations (Hamilton, Ontario, and Valleyfield, Quebec) bring their own advantages. However, TGOD has officially gone international, through expanding into Europe and the Caribbean, through new ventures in Poland, Denmark and Jamaica respectfully. Both the company’s Canadian operations (Hamilton, Ontario, and Valleyfield, Quebec) bring their own advantages. However, TGOD has officially gone international, through expanding into Europe and the Caribbean, through new ventures in Denmark and Jamaica respectfully. In Denmark, through a 50/50 joint venture, TGOD stands to take part in two new facilities located within 1.3 million sq ft state-of-the-art automated greenhouses. The expectation is for an additional 25,000 kgs of high-quality organic cannabis production capacity, to be provided to the growing European market. Once completed, TGOD’s net annual growing capacity across all facilities and joint-ventures will total 195,000 kgs—Which today would rank the company at 4th largest in the world. However, what stands out, is that TGOD’s products will be organic, unlike the bulk of its competitors in the space. As well, through a strategic investment partnership, TGOD has the backing of Aurora Cannabis. Aurora has already invested $78 million into TGOD, as well as fostered a relationship with the its design team from Aurora Sky. Within the deal is a built-in purchase agreement for 20% of TGOD’s high-quality, organic product. But TGOD isn’t just looking at its organic advantage from a raw plant perspective. Among its peers, the company has allocated the largest budget toward R&D, which will help the company develop new products in forms appealing across the entire market to future consumers as well as current ones. Poland is nothing shy of incredible. TGOD purchased a 100% interest in HemPoland for $20.4 million and invested an additional $13.4 million in cash for rapid expansion. HemPoland acts as a gateway to Europe’s 740 million people with operations in 13 countries across the continent with sales in over 700 locations. The company produced 32,000 kgs of dried flower in 2017 that was used in its premier CBD oil brand Cannabigold. They are on track to generate over $42.1 million in EBITDA by 2020 representing a significant value driver for TGOD shareholders. In Denmark, through a 50/50 joint venture, TGOD stands to take part in two new facilities located within 1.3 million sq. ft. state-of-the-art automated greenhouses. The expectation is for an additional 25,000 kgs of high-quality organic cannabis production capacity, to be provided to the growing European market. Recently, TGOD purchased a 49% interest in Epican Medicinals. Epican is a vertically integrated Jamaican cannabis company with cultivation, extraction, manufacturing and retail distribution licenses. The company grows approximately 1,300 kgs of organic cannabis and will increase that to 14,000 kgs in the near future. In July, the company opened Jamaica’s second legal dispensary located in Kingston which provides immediate revenue to Epican. The partnership will provide a low-cost platform from which TGOD is supplied premium Jamaican grown medical cannabis for export to international jurisdictions. The Green Organic Dutchman operates as a cannabinoid-based research and development company in Canada. It produces organic cannabis products, including organic dried cannabis, cannabis oils, and seeds for medical applications in addition to a strategic beverage division dedicated to developing novel products. While these comparables represent some of the other leading players in the cannabis sector, each have entered the market at different stages and present different strengths. Each company presents its own premium quality cannabis products, while none currently mass produce organic cannabis. It’s worth looking at each individually, while also seeing how our feature company stacks up among its peers. Aurora Cannabis produces and distributes medical marijuana products in Canada. The company’s products consist of dried cannabis and cannabis oil. It also operates as a pharmaceutical wholesaler and narcotics dealer of medical marijuana in Germany and the European Union; and produces and sells proprietary systems for the indoor cultivation of cannabis, organic microgreens, vegetables, and herbs. Canopy Growth is a leader in the cannabis space, with considerable sway, and known for its ability to acquire assets and build massive greenhouses. Through its subsidiaries, Canopy produces and sells medical marijuana products in Canada, including dried, oil, and softgels. Canopy Growth works collaboratively with Canopy Rivers, an investment and operating platform structured to pursue opportunities in the emerging global cannabis sector, including licensed producers, late-stage applicants, pharmaceutical formulators, branded developers and distributors, and technology and media platforms. The Hydropothecary Corporation aka HEXO, together with its subsidiaries, produces and distributes medical marijuana products. The Quebec-based company recently made a splash by being selected by Molson Coors to be the official partner for development of a new line of cannabis-infused beverages, with one of Canada’s largest beverage distributors. Hydropothecary is rapidly increasing its production capacity in the lead-up to recreational adult-use cannabis. Expansion plans will result in a total of 1.3 million sq. ft. of production space, producing 108,000 kg of dried cannabis per year, making Hydropothecary one of the largest producers in the country. For over a year, the market has been relatively consistent in its bullish perception of cannabis. Amidst an array of estimates on where cannabis spending is headed, even the most conservative estimates predict double digits CAGR of growth. They project that two thirds of spending will come from the adult-use (recreational) market, while medical marijuana will take up the remaining third due to its obvious advantages with insurance providers. 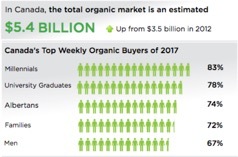 With plenty of growth left to be witnessed, the companies with their own built-in advantages, such as organic certification stand to make major gains as the market matures. TGOD is fully funded, with $350 million raised to date. Funded for expansion, with construction underway totaling over 1.3 million sq ft in combined facilities, allowing for 170,000 kgs of annual production. Proven management team, with experience in executive and operational management specific to: finance, consumer packaged goods, beverages, brand building, pharmaceutical, retail, international markets, and the cannabis industry. Cornerstone investment from investor, Aurora Cannabis, for $78 million—with a purchase agreement already in place for 20% of TGOD’s high-quality, organic product. Along with Aurora’s financial support comes industry leading construction and design partnership on TGOD’s facilities, through a project team that includes: Aurora Larssen Projects Inc. (ALPS), Eaton Power, Hamilton Utilities Corp., and Ledcor Group. 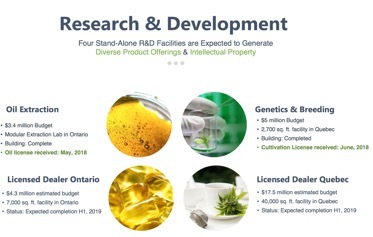 Significant Research & Development budget, focused on cultivation, clinical trials, and product development including an industry first 40,000 sq ft state-of-the-art beverage facility. Industry-unique specialization, designed to produce high-quality, organic cannabis, grown in living soil with established organic growing techniques and intellectual property. TGOD is securing exclusive licensing deals with best in class brands that have proven products, strong revenue growth, and intellectual property. These products will be included in TGOD’s global sales and distribution channels. Unique share structure that includes over 20,000 retail shareholders. With a unique value proposition in what can be seen as an increasingly crowded cannabis scene, The Green Organic Dutchman Holdings Ltd. (‘TGOD’) has found a way to stand out. Holding the very rare distinction of being one of a tiny number of licensed producers of certified organic cannabis, the company has found a niche ahead of the market catching on. As organic cannabis currently fetches a price premium over 30%, it’s also the form of product that the majority of consumers are seeking. Customers are more than willing to pay more for the quality levels they seek—which is what TGOD is banking on. Not only has the market shown its confidence in TGOD since its IPO earlier this year, but the company has courted several major players that can help the company reach its goals. While being fully funded to carry out their construction and expansion plans, TGOD also has the powerful backing of Aurora Cannabis, Ledcor Group, and Eaton Corp. on its flagship operations. TGOD’s organic advantage is very real. As the company further develops out new consumer packaged products, into beverage, food, health, and beauty lines, it will continue to expand its already enticing and clear blue sky. If you want more information on TGOD or just to stay on top of the company’s advances, you can subscribe to the company newsletter at http://tgod.ca. Nothing in this publication should be considered as personalized financial advice. We are not licensed under any securities laws to address your particular financial situation. No communication by our employees to you should be deemed as personalized financial advice. Please consult a licensed financial advisor before making any investment decision. This is a paid advertisement and is neither an offer nor recommendation to buy or sell any security. We hold no investment licenses and are thus neither licensed nor qualified to provide investment advice. The content in this report or email is not provided to any individual with a view toward their individual circumstances. Equity Insider is a wholly-owned subsidiary of Market IQ Media Group, Inc. (“MIQ”). MIQ has been paid a fee for The Green Organic Dutchman Holdings (“TGOD”). advertising and digital media from the company. 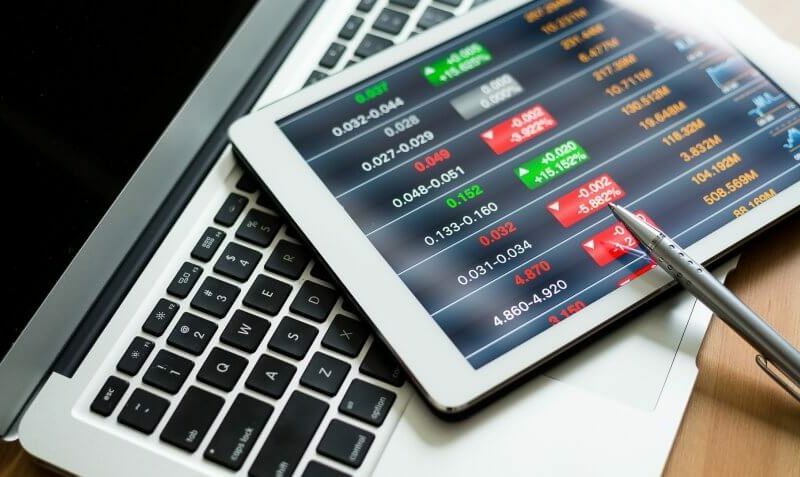 There may be 3rd parties who may have shares of TGOD and may liquidate their shares which could have a negative effect on the price of the stock. This compensation constitutes a conflict of interest as to our ability to remain objective in our communication regarding the profiled company. Because of this conflict, individuals are strongly encouraged to not use this newsletter as the basis for any investment decision. The owner/operator of MIQ expects to purchase shares of TGOD through a private placement at which point this disclaimer will be updated to reflect those changes. As of this correspondence (Sep. 1, 2018), MIQ holds no shares of TGOD.